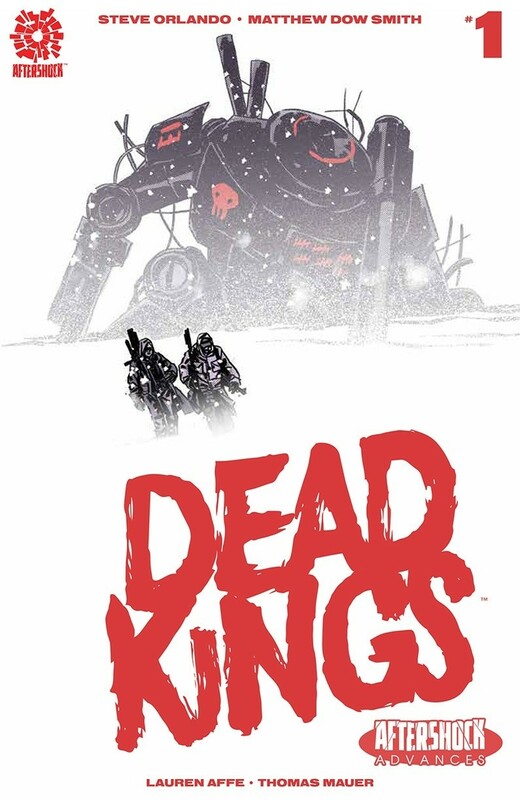 Set in a “post-post-apocalypse” landscape, the first pages of Dead Kings show a world riddled with violence. We see two giant mechs fighting jets in the distance, while a mother gives birth to twins in a small home in the center of this epic battle. Awesome introductory dialog that includes lines like: “The kings have all died, leaving their mad courts to rule.” I understand that this is the first issue in what promises to be a long story, but the writer missed many opportunities to draw future readers into the story. The opening pages set up the rest of the story years into the future, and invite the reader into what promises to be a great story. I read this 22-page (advertisements call it a 40-page book but more on that later) book 4 times and I still don’t have a clue as to what is going on for certain. What I do know is that there was some type of war in the distant past. We follow Sasha as he travels in search of a warrior to aid him in his quest. He invites a beggar to dinner only to be abandoned by him at the first signs of trouble, he is rescued by the warrior he has been searching for: Stone Mary. If you’ve seen the advertisements for this comic with the two mechs fighting then congratulations, you’ve seen all the action sequences in this entire 22-page issue. Why do I keep mentioning the page count? Like I mentioned previously, those advertisements that ruthlessly spoiled the major action sequences also promise a 40-page adventure. Almost half of this $3.99 book has absolutely nothing to contribute to this crippled storyline. The main character is little more than a stumbling buffoon, he has survived some of the harshest environments in this alternate future, but can’t spot an obvious trap? He has survived in the streets, but somehow can’t read people? I refuse to spoil his plan on helping his brother escape from the concentration camp like prison, but it involves explosives and his own testes. 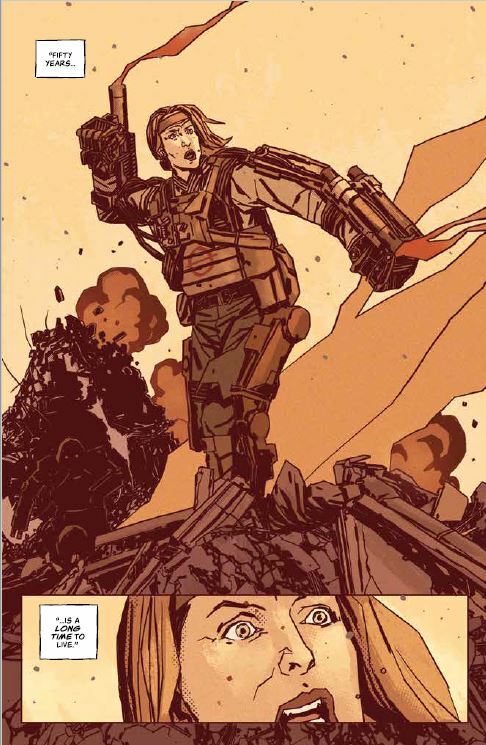 The writer goes well out of his way to try make Stone Mary look like a battle hardened soldier, a heroine who proves her virility by sharing her bed with multiple partners. Instead, she comes across like a bitter old hag. The only image reflecting her past glory days are ruined by the inconsistent art that seems to deteriorate with each page. The artist is trying to apply a certain style to the panels; the closeups are devently drawn but any distance shots that require multiple perspectives simply come up short. The art changes so much that it almost looks like this was done by multiple rushed artists that needed to make a deadline; they traced as much as they could and altered things just enough to claim they were original works. The colorist tries her best to cover up any errors with shadows and heavy colors, but those make the problems much more obvious. 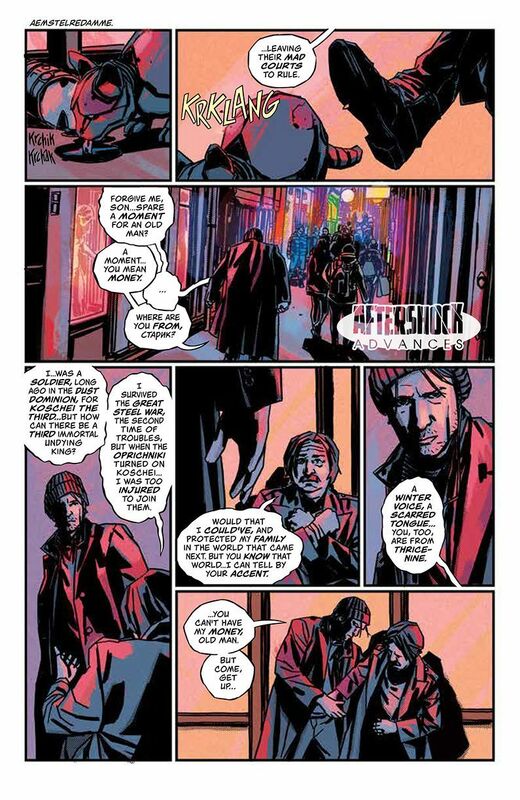 As you flip through the pages of this comic, it looks like the colorist spent so much time covering up flaws that she was also rushed to complete the project. 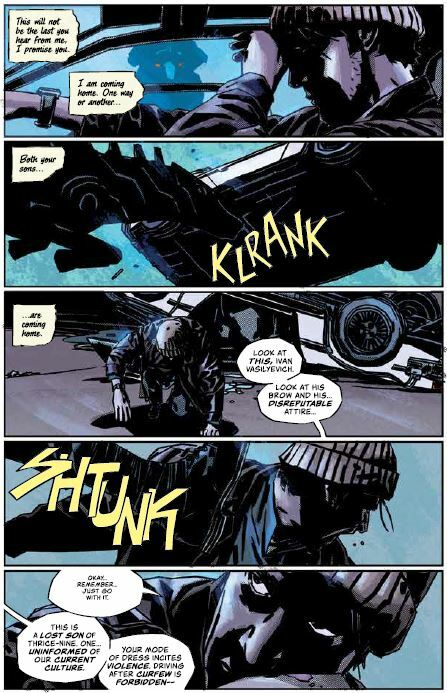 However, her use of color and her shading make the few good panels really stand out. While this book had the potential of being something great, it wastes too much time trying to tell a story that has been poorly planned. The characters are beyond boring and unlikeable. The art gets progressively worst as you flip through the pages. The colorist looks like she gave up after countless coverups. I hope the story picks up in later issues, but for a first issue I think it should have delivered more of an impact to make the readers become invested in the story. There have been plenty of action comics that are heavy on story, but unlike this issue those stories were worth telling. According to Mike, this one earns a 1 out of 5. If you get it as a gift, smile politely and just say “thank you”. 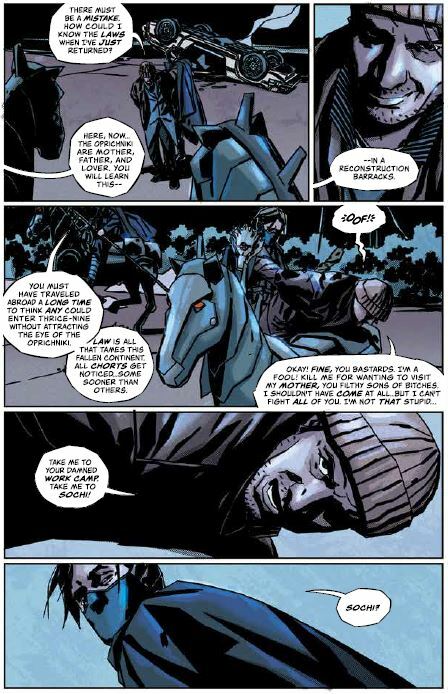 Dead Kings is written by Steve Orlando, drawn by Matthew Dow Smith, with colors by Lauren Affe and letters by Thomas Mauer. Available in shops October 24, 2018. NEXT POST Next post: Indie Comics Showcase: Sweet 16!